Is there any better feeling for a fantasy owner than knowing you need a couple more points to cap off a win, and it just so happens that one of your players is on the field late in the fourth quarter during their team’s comeback drive? For those who have Santonio Holmes, Adrian Peterson, Brett Favre, Philip Rivers, or any of the other key offensive players on the Vikings, Jets or Chargers, you probably now exactly what I am talking about. Each of those three teams were able to put together some impressive drives during the final 15 minutes of the game to give their team, and many fantasy owners, big victories at this point in the season. But it is not only the close games that can have a big impact on fantasy leagues. Look no further than the Browns blowout victory over the Patriots yesterday afternoon, when both Tom Brady and Peyton Hillis picked up touchdowns late in the fourth quarter when it appeared as though the outcome had already been determined. Such is life within the world of fantasy football, where there is clearly no mercy. Even during a blowout, when it seems like nothing else is on the line, there is always at least one owner sitting on the edge of his seat praying that his player gets that one more crucial touch to put him over the hump. Here is a look at what happened during week nine in this edition of the TPS Monday NFL Fantasy Rewind. Tampa Bay 21 at Atlanta 27 – One week LeGarrette Blount runs for 120 yards and two touchdowns. The next week he can’t even convert on a 4th and inches from the goal line to win the game. Miami 10 at Baltimore 26 – With only 8 touchdowns and 10 interceptions on the season, maybe Chad Henne isn’t the Dolphins’ quarterback of the future. Chicago 22 at Buffalo 19 (in Toronto) – Not even a change of scenery could help the Bills get their first win. New Orleans 34 at Carolina 3 – I would say the Jonathan Stewart injury is a big loss for fantasy owners, but when you are averaging 26 yards per game, it really isn’t. New England 14 at Cleveland 34 – With 220 total yards and two touchdowns, Peyton Hillis showed us all why he may very well be fantasy football’s steal of the year. New York Jets 23 at Detroit 20 – If you were looking for a kicker, you should consider picking up the Lions’ Ndamukong Suh…On second thought, maybe not. San Diego 29 at Houston 23 – Without the services of Antonio Gates, Vincent Jackson, Malcom Floyd and Legedu Naanee, Rivers’ four touchdown performance showed us why he is an easy pick as the top quarterback in fantasy football. 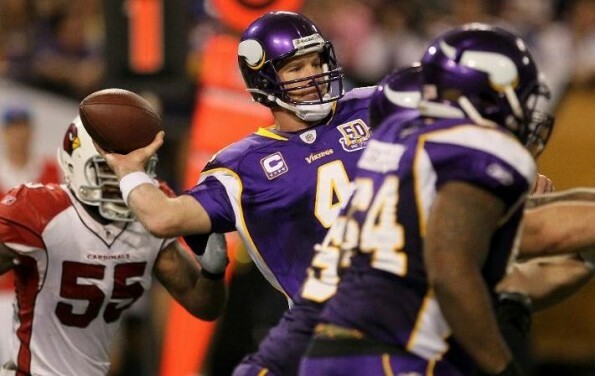 Arizona 24 at Minnesota 27 -Maybe old-man Favre still does have some magic left in that arm of his. New York Giants 41 at Seattle 7 – For a team that claims to have a twelfth man at home, the Seahawks defense looked more like they were playing with seven men on the field. Indianapolis 24 at Philadelphia 26 – Looks like Andy Reid’s decision to re-insert Vick as the starting quarterback was the right decision. Dallas 7 at Green Bay 45 – If the Cowboys were to play the Buffalo Bills today, I wonder who would win?